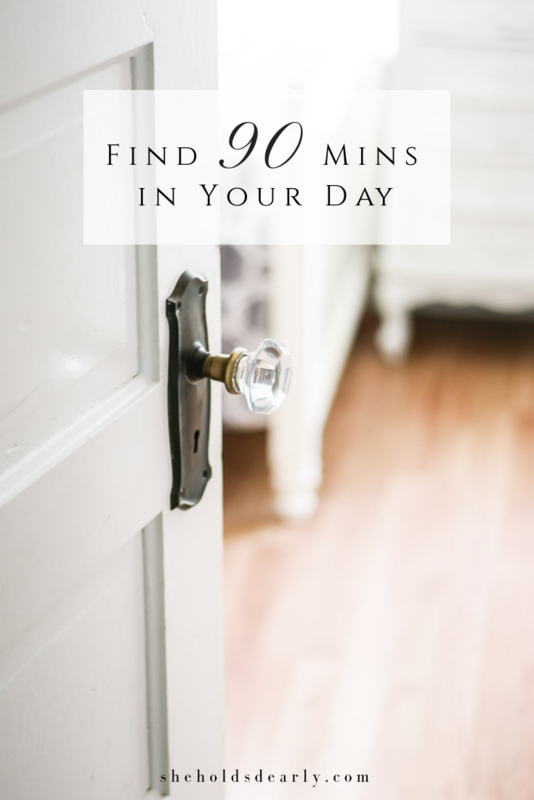 Today, I am super excited to be part of a blog hop hosted by Alicia from A Burst of Beautiful! 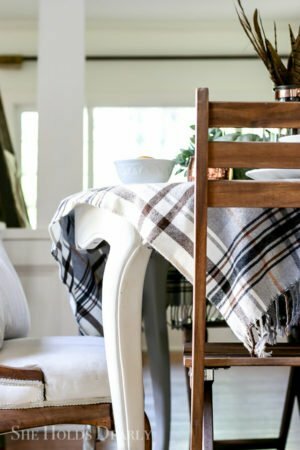 You get to take a peak inside (and outside) the homes of some extremely talented bloggers and get the scoop on how they styled their fall tables. So pull up a chair. 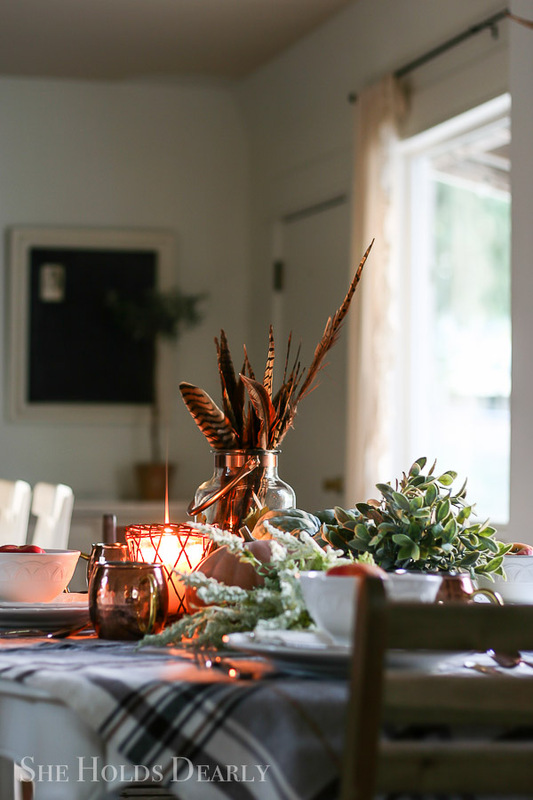 . .
Of all the seasons to focus on table decor, fall feels like the most important because of the significance of Thanksgiving dinner. I am already taking inventory on who is still in town in our family and physically able to host Thanksgiving and I can see that I will get the honor again. Actually, it’s a relief to already have my table layout decided upon and I am excited to share it with you. 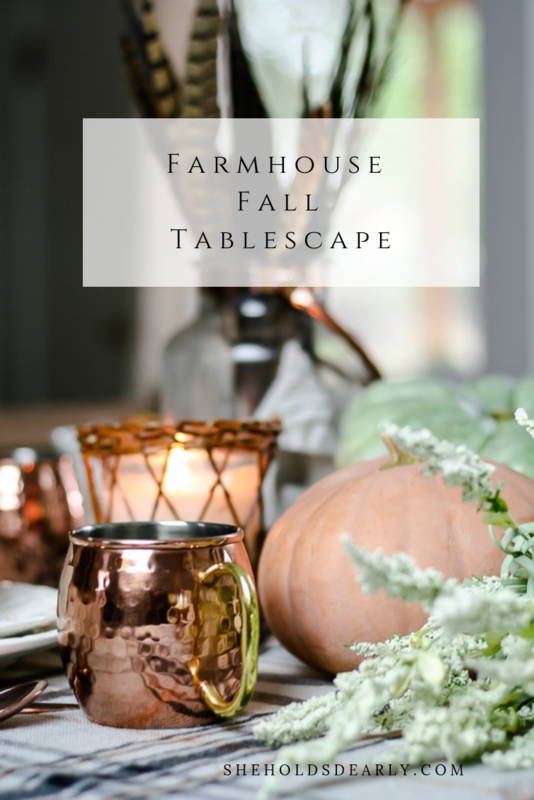 Let me take you through the design process I used to design this year’s Farmhouse Fall Tablescape. 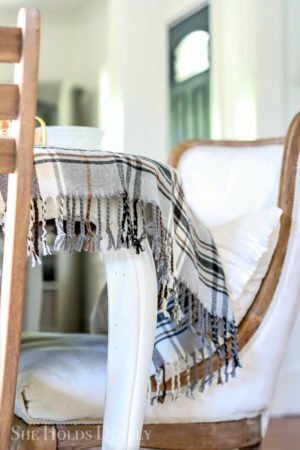 First, I laid my favorite wool blanket down as my table cloth. I turned it at an angle so the lines were running diagonally and the fringe was sweeping across on either end. I love the uniqueness and coziness of choosing a throw blanket as the foundation for this look. Next, I placed a sage green and a peach heirloom pumpkin in the center and used some pheasant feathers in a jug to add some height and texture. 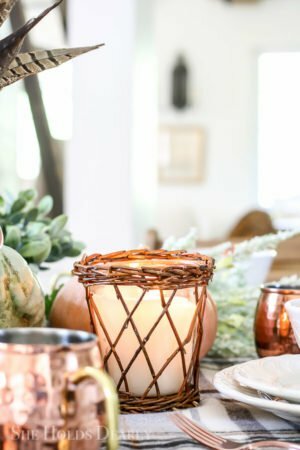 To bring in even more texture and some warmth, I tucked in a faux sage plant and a sprig of white flowers with my favorite Park Hill candle. Once the centerpiece was done, I could focus on the place settings. I would love to own some brown transferware someday, even if it were just some salad plates. But, until that day, my thrifted, mis-matched white dishes will do just fine. 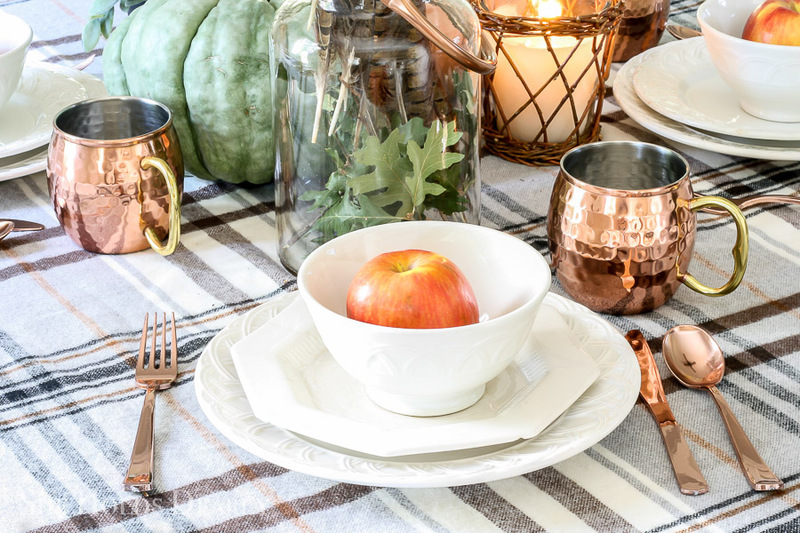 My love for all things copper gets to show itself each fall. 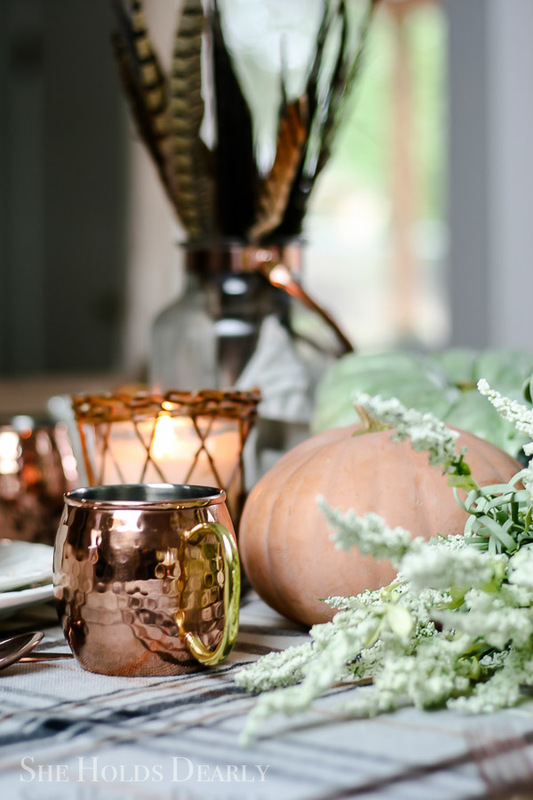 And in this case, I pulled out my copper Moscow mule mugs and plastic (shhhhh!) copper flatware. When you have a lot of company coming and want to have some special silverware, the metallic plastic sets can really be the way to go! 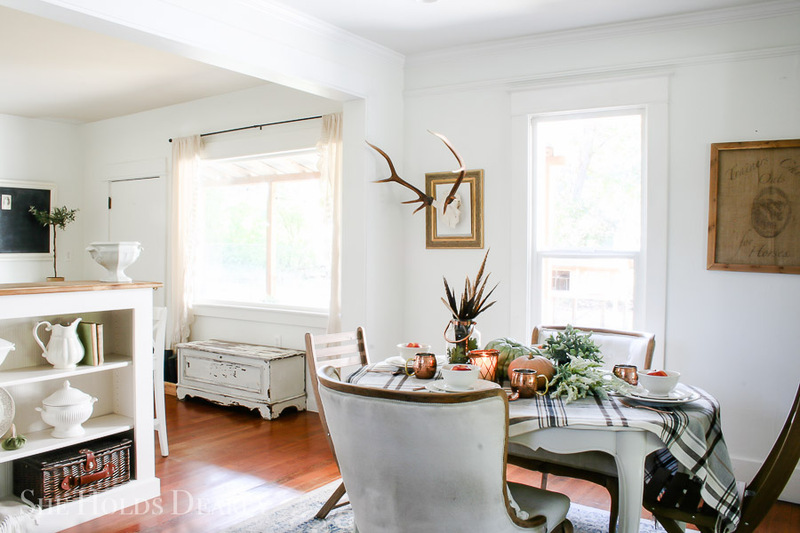 And finally, I just grabbed what I had on hand for the finishing touch- an apple that could act as a place card or just a humble farmhouse detail with a pop of color. 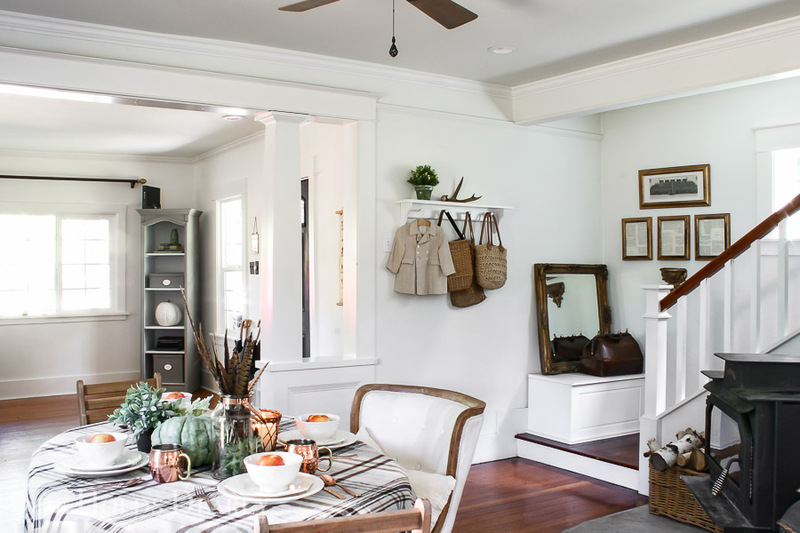 Be sure to stop by these other beautiful home and see what inspiration they have in store! And, as always, thanks for stopping by our farmhouse. Happy FALL, my dears!! 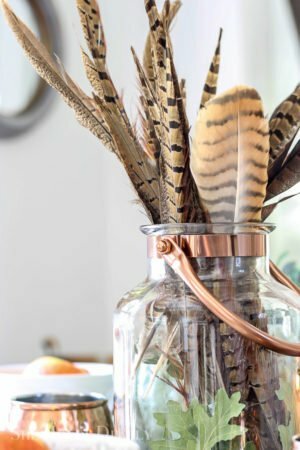 Who knew feathers in a jar could be so perfect! Love them and everything else. Such a beautiful table! Thank you, Michael! That means a lot to me. 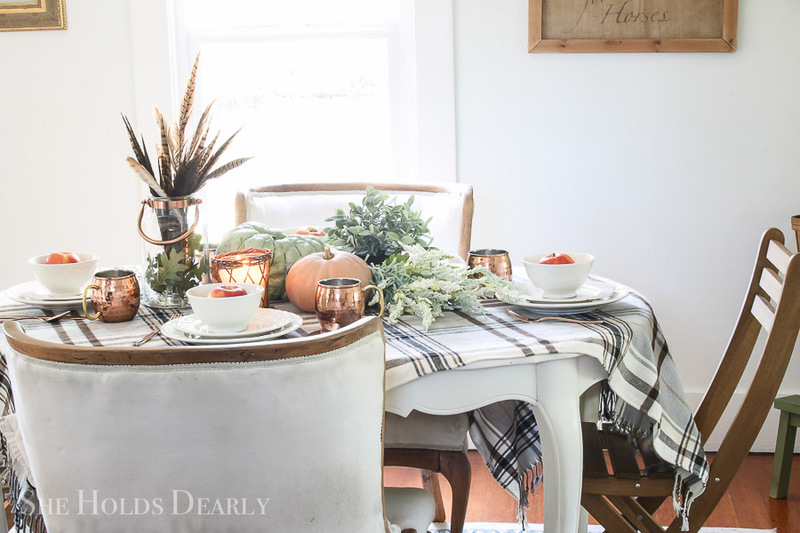 Sarah, what a beautiful table you set for Thanksgiving. I love the feathers, such a great idea! Thank you so much! Also, thank you for hosting the blog hop, you did such a great job! Oh I so adore these colors. 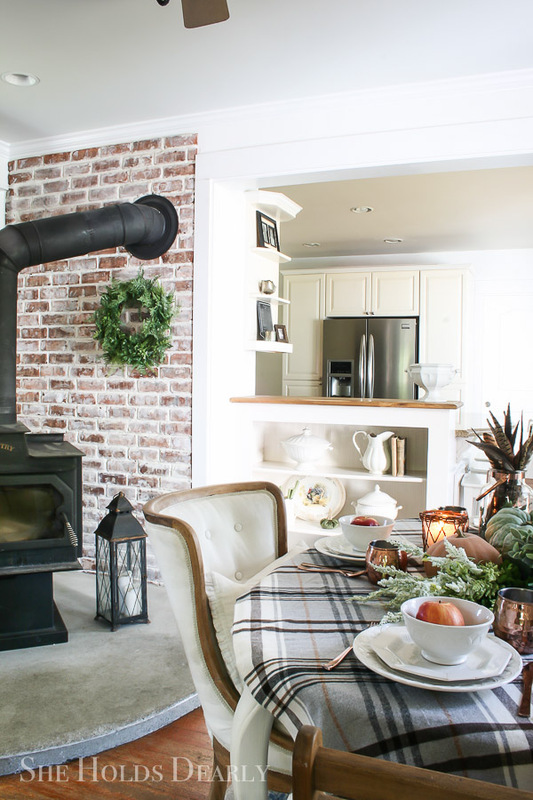 It looks so cozy! 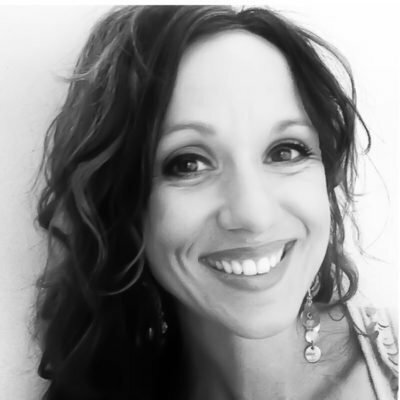 Thank you, Shannon! You’re so talented, I really appreciate your encouragment. Such a beautiful tablescape. I love your attention to detail from the feathers to the sweet blanket and pretty copper. What a sweet thing to say! I had so much fun putting this table scape together. Your creativity always amazing me! I love how you used the blanket for your table cloth and who would have known the silverware were plastic! I also am in love with the candle in the wicker basket. I’ll have to check out that candle company! Everything is so lovely! I love your home’s contrast of white and dark. All of it. 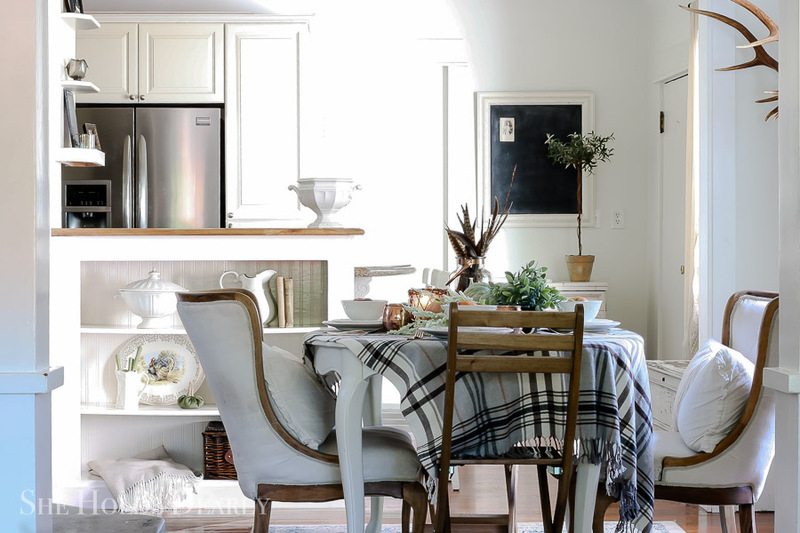 And it even translates beautifully to your tablescape. 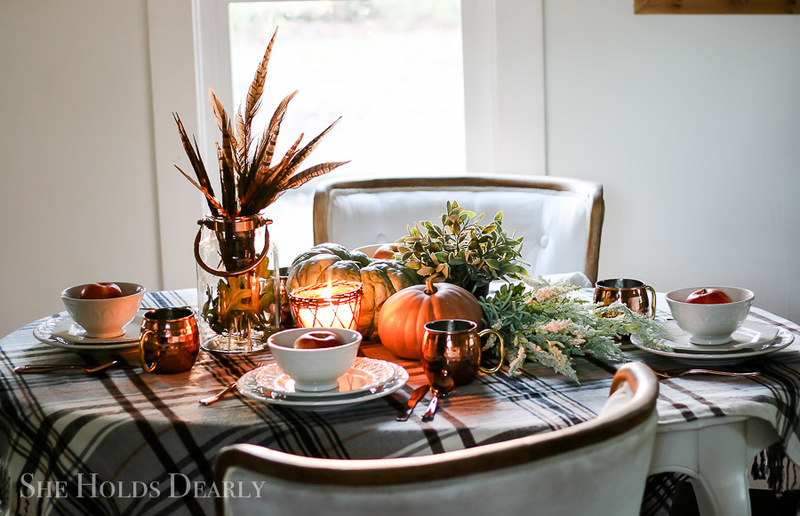 How I love that plaid tablecloth, which sets off everything else beautifully. As always … LOVELY.